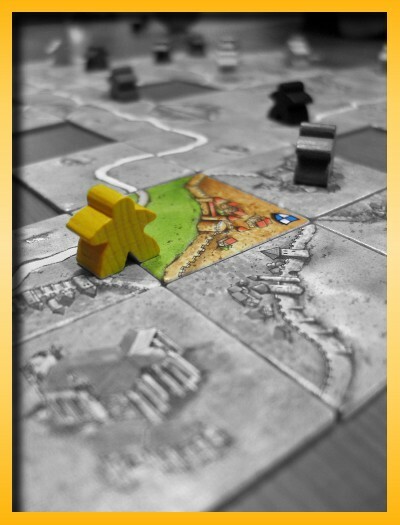 The muggy day brought out an oldie but a goodie: Carcassonne. The four of us play with some house rules and a conglomeration of expansions. We don’t play with the bogus (in my opinion) river expansion but we do play with Inns and Cathedrals. This expansion gives you an additional double-sized meeple but we usually don’t play with the big guy as it adds a sneaky element that my kids tend not to appreciate. We also play with the farmer scoring rules that grant the farmer only three points per completed city and a player can only score points for a city once even it two farmers are in disconnected fields. Our final house rule is to play the game by laying a tile and then drawing a tile rather than drawing a tile and then playing. Having your next tile in your hand while others play speeds up the game by removing some of the analysis paralysis of deciding what to do with your surprise draw from the bag. Carcassonne was one my first purchases years ago and I’ve given a copy of the game to several people as gifts. It still holds a special spot in my game psyche even if it is a little two-dimensional in strategy. I have the strategically deeper Carcassone the City but it hasn’t seen the table in over a year. Noah and I broke out the borrowed copy of Dos Rios on Friday night while Sophie finished up watching the first Pirates of the Caribbean movie on DVD. We only got to play about half of the game before it got to late but it was enough to shake out some question in the rules and to spark some questions I could pose to the BGG community for clarification. On Sunday afternoon, Sophie and I managed to get in an entire game. I can’t think of a better comment from Sophie than her, “I wish we owned this!”. I think I agree but I’m reserving the right to change my mind after playing a few more games and with more people. The game board consists of six puzzle-like pieces that form the frame of the game (city and lakes, side pieces, and the mountains and springs). The center of the board is randomly populated with hex tiles consisting of three terrain types: field, hill, and forest and the fields hold three types of crops (corn, tobacco, and wheat). I’m a great fan of the constructed board to keep the game different every time. 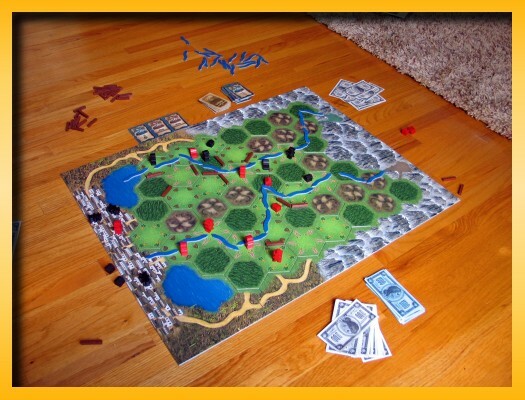 The game begins with river segments being laid from the springs in the mountains at the top of the board down through the hexes towards the lakes and city at the bottom of the board. The river is required to always flow downhill following the path of least resistance. When the river enters a hex it must exit into one of the three hexes that are below it. The terrain type of the hex determines which of the three hexes it will flow to. 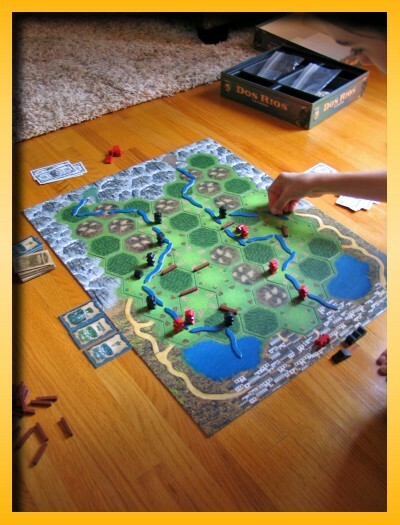 Hills are higher than other terrain types, forest hexes are higher than field, and field is higher than the lakes, city, or the wagon trail along the sides of the board. If the terrain types are the same, then the player can choose which direction the river will flow. There are two springs depicted on the board but it is possible for the rivers to join forming a single river as it flows towards the bottom of the board. Beside the board, harvest cards are shuffled and dealt face up such that the same number of cards as players show plus one. The remainder are left in a pile next to the board. Once the rivers are placed, players distribute three of their campesinos to the hexes they choose leaving three campesinos in the city. Players begin the game with two dams (small wooden sticks), four wooden casas, and one hacienda. A turn is composed of players ‘spending’ six action points to walk their campesinos from one hex to the next. Players can never place more than two of their campesinos on any one hex and players are not allowed to move through a hex or stop on a hex containing campesinos of another player unless they are capable of chasing off the opposition. The rules for chasing off an opponent require that the attacking player be more powerful in number (two compressions to one) or by entering the hex from higher ground (hill to forest, forest to field). Chased off campesinos are sent to the city. While spending your six action points, you can also build dams by placing your small sticks in between the boundaries of the hexes and rerouting the river. You can also build casas ($500 Rio each) and/or your hacienda ($1000 Rio) in any hex containing one of two of your campesinos. It is illegal to place a dam such that the river could not flow out of one of the bottom three sides of the hex. You are allowed to build dams in areas where the river is not currently flowing and once placed the dams are permanent. At the end of your turn, you have a choice of playing the end-most harvest card. If you choose not to, the card is placed near the draw deck and the rest slide down for the next player. If you choose to perform the harvest card action, you resolve the action, place it next to the draw deck in a discard pile, shift the face up cards down, and expose a new harvest card from the draw pile. The harvest cards come in four types: lumber, river, crop, and desperados. The lumber card allows all players to receive a dam for each forest hex they control (by having a campesinos, a casa, or their hacienda in the hex) and that have the river running through it. The river cards allow all players to receive $100 Rio for each watered field they control and one dam for each watered forest they control. The river cards treat each river separately color coding one green and the other brown. The crop cards give all players $100 Rio for each watered and matching crop they control. The final card type, desperado, is resolved immediately as it’s turned up. When played, the desperados chase off the first three campesinos they can starting from the top of the board descending down the river noted on the card. Whoa…in writing it down I realize it’s fairly hard to describe yet in actuality it’s pretty easy to play. The game is nothing but chaos though as the river can change wildly from one player to the next as they try to force the river into areas they control for the harvest cards that are showing. 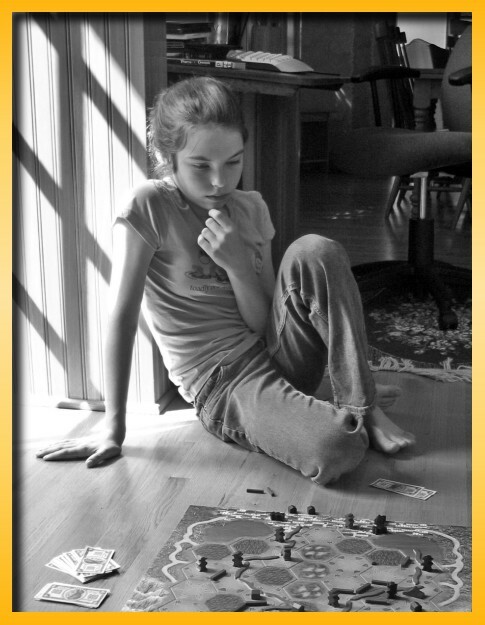 The game is won immediately when the first player builds three casas and their hacienda in watered fields or someone builds all five of their buildings. I can see where the game might slow from analysis paralysis as players try to maximize their six moves, decide where to build their dams, and decide where to build their casas and their hacienda. The harvest card mechanic is interesting in that if you choose to not play the card you are in most cases allowing a different player to get that same card on subsequent turns. Dos Rios is a highly tactical game and can be very cut-throat when dams are built above your opponents fields causing them to dry up after rerouting the flow. It takes a special player to see the side-effects of river rerouting. The choice of where to build your casas and hacienda are agonizing. Even though there is extreme chaos, I liked Dos Rios because it rewards players who can see what to do. If you’re position is thwarted by a tricky maneuver, then it’s not that the game is too chaotic. Instead, it’s really just your fault for not seeing it and planning ahead for it. On more than one occasion my good board position was destroyed by marauding desperados coming down the river. That’s not a bad game per se…that’s just my fault for not being prepared for it. 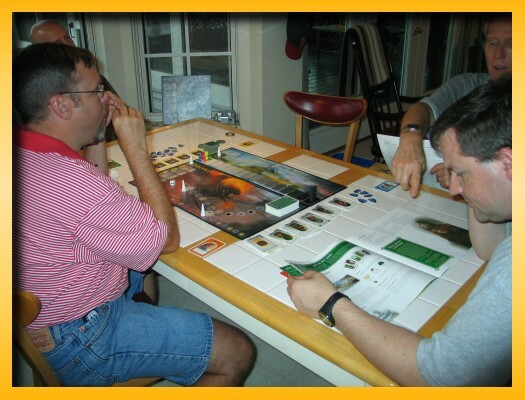 We gathered at Keith’s house last night for the August, 2006 installment of Analog Game Night. Keith, Paul, Ken, Rich, and myself settled in for a night of learning the 2000 edition of Lord of the Rings by Reiner Knizia. Each player takes on the role of a hobbit in the fellowship and players, each with their special power, cooperate to move the ring towards Mount Doom. Along the journey, Sauron and his legion of Orcs rain on your parade causing you to adjust your tactics so that you all can win the battle against the game. The game is fairly simplistic but the written rules really stunk. It took us a long time to muddle through them. We ended up referring to the rules throughout most of the game. It was only near the end that the event symbols started to sink in. 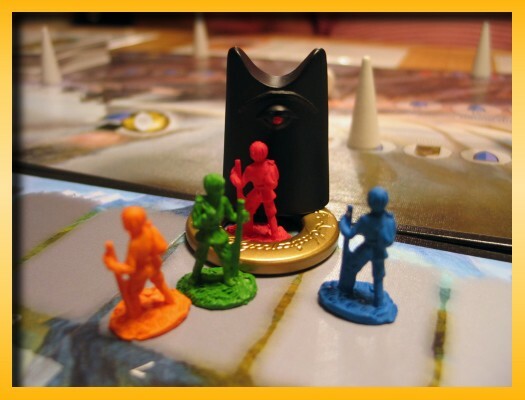 The game is composed of a single board that tracks the movement of each player’s hobbit as it progresses down a track towards the eye of Sauron. Sauron is also moving from the other end of the track towards the hapless hobbits. 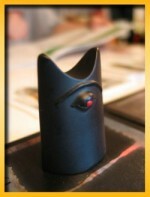 The game comes with four scenarios that must be completed to move the ring from Moria to Mordor. Each scenario is tracked on its own board. Players flip event tiles representing random good and bad events and move the scenario markers towards the ends of tracks gathering life tokens, shields, trigger ‘bad stuff’, play cards to help others or gather stuff, etc. On the final Mordor board, players attempt to advance to Mt. Doom and thwart the onslaught of ‘bad stuff’ hoping to keep Sauron from destroying the tiny colored hobbits. Lord of the Rings is kind of an odd game and my limited plays of cooperative games would put Shadows Over Camelot out in front as the better game. I felt the event tiles dominated the play to the extent that a bad run of tiles can really blow your ability to survive. I agree with Keith that we need to play it a few more times so that we don’t forget everything and get bogged down in the rule interpretation. All in all, the game made for an enjoyable evening. About halfway through it though, I was starting to wonder if it was worth it and I had lost interest in the game. I was eliminated before the final round but I managed to tie for the lead after the shield count was tallied when Sauron killed the ring bearer. On a good note, I got to be Frodo which was kind of cool. In actuality, I was just glad I wasn’t Fatty. I’m interested in designating Ken as the permanent Fatty…anybody with me?